Form Description: When an employee turns in a request for mileage reimbursement, the paperwork needs to be crystal clear. One way that this clarity can be achieved is by using this Mileage Reimbursement Form. Not only does the form provide adequate locations for the date and odometer readings at the start and finish of the trip, but will also automatically calculate the total miles driven for that trip. Best of all, this Mileage Reimbursement form will keep a running tally, and auto-calculate the amount to be reimbursed as long as you know what the rate per mile is supposed to be. Just because you have to deal with some boring paperwork as part of your job, doesn’t mean that the paperwork itself has to look boring. Spice things up a bit with the use of this fancy edition of the Reimbursement Form. You get to pass along all the same important information, but this time it doesn’t necessarily need to be all that boring. Why not take the time to show your fun side? If there is a single drawback to keeping large amounts of information on a form, it has got to be how easy it is to get distracted and confused about what is on it. One way to combat that problem is by using a Reimbursement Form that has numbered lines. This particular edition of the form has been created with those numbered lines to help you later on reference the information that you have entered onto it. Furthermore, with this edition of the Mileage Reimbursement Form you have extra wide rows. These wide rows allow you the easier ability to enter the information in by hand. This can definitely be a huge help when you are filling in the needed information by hand as you drive around. All in all, it can make a great working copy to use until you are ready for the final version that you will want to print up and look nice and neat. You can download a PDF version of the "Fancy Wide Numbered Row Mileage Reimbursement Form" form absolutely free. You can also, for a small payment, download a fully editable version of the form that you can customize as you desire. (Don't know which format to choose? Here's how to make your choice.) What would you like to do? 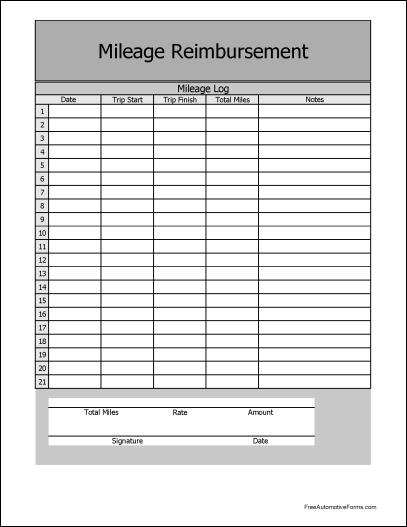 FreeAutomotiveForms' free "Fancy Wide Numbered Row Mileage Reimbursement Form" form is associated with the following keywords: Log, Automotive, expense report, mileage, reimbursement, payment, fancy, numbered row, wide row.